Down v Meath – Sunday 2 February at Abbey Grammar, Newry – 2pm. “We’re not in this Division to make up the numbers” says Ryan McShane, Down Coach. A new season and it’s a new look Down Ladies set up with Annaclone club man Myles Cahill taking up the helm and hoping to guide the Mourne girls to more silverware in 2014. Following on from their emphatic win over the then All-Ireland and Ulster Champions Armagh in the Div 3 final in 2013, the Down girls earned their rightful place in Div 2 of the Tesco Home Grown NFL in 2014 writes Barry McConville. Ryan McShane, Down ladies Gaelic football coach, looking forward to the clash with Meath. Down’s first opposition are newly relegated Meath, who had a dismal time in Division 1 last year, only winning one of their seven matches at the last throw of the dice against Laois, narrowly avoiding a embarrassing league whitewash. There is no doubt Meath will be hungry to make amends for the season from hell last year and make a better impression in Division 2. However they have the not so small hurdle of getting past Down in their own backyard. 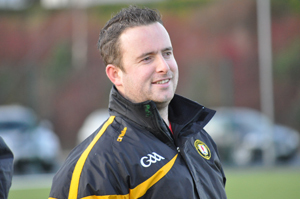 Down Coach and Clonduff club man Ryan McShane spoke ahead of the encounter. He said: “The girls are looking forward to testing themselves in Division 2 after gaining promotion last year. They’ve been working very hard since November to prepare for a league that will contain a much stronger opposition than last year. “We have Meath first and they will be aiming to get straight back to Division one after being relegated from the top flight last season, but we are not in this league to make up numbers. We are blessed with talent in our squad and we are a tight unit. We’ve added around nine new players to the squad from last year and feel we have a good mix of youth and experience. We’ll take it one game at a time and go from there. “Down have learnt a lot from their 2013 campaign and have matured as a team who have experienced the highs and lows of county football, all in one short year. Having reached an Ulster final for the first time in over ten years, the Mourne girls faced a Fermanagh side with a lot more guile and experience. “Fermanagh played some outstanding football and were deserved winners of Ulster, and the Down girls went home disappointed but determined to take the positives from the game and learn from the experience. Myles Cahill, Down ladies manager with coach Diane O’Hora. 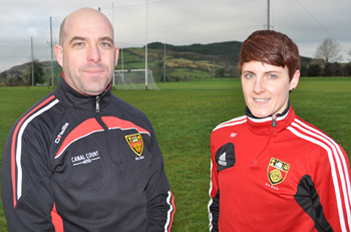 With the retention from last year of Ryan McShane and Mark Copeland, who helped guide Down to their successes in 2013 along with selector Kevin Leneghan, Down have strengthened their backroom team this year with the addition of Diane O’Hora as coach. Diane managed Longford Ladies for a number of years, a Mayo native with a wealth of experience; she has been working with the Down girls from November. Diane played in the forward line for Mayo, captained the team in All-Ireland successes and has four All-Ireland winners’ medals and two All Stars. She’ll be hoping to share her knowledge of what it takes to perform at the highest level of Gaelic football with the young Down squad, who will experience some of the toughest games of their careers to date in Division 2. Down’s first home game is set for the Abbey Grammar School on the 2 February qith a 2pm throw-in. 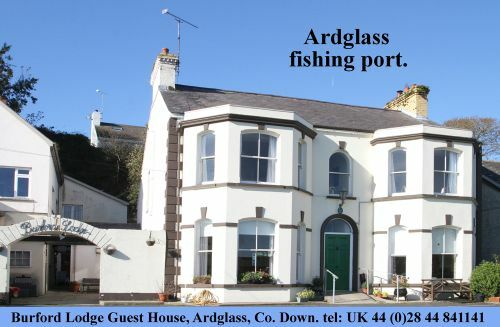 However, their following two home games will played at the home of Down football in Pairc Esler. With greater co-operation and integration between the Gaelic codes, counties throughout the country are making strides to bring more families to the games and bring the different codes to a wider audience and Down are at the forefront of strategy. The Down County Boards plan to play inter-County double headers at Pairc Esler with Down Ladies Football and Down Camogie hosting travelling teams when fixtures allow it at Pairc Esler. This will give local Gaels the opportunity to bring the whole family along and experience and support the local girls in their respective codes. Let’s not forget both the Down Ladies footballers and Camogs train every bit as hard as their male counterparts and sacrifice every bit as much of their free time and home life, so they deserve every bit as much support as the men!